A beach towel, magazine, bottled water and a snack is all you need for this cute small canvas beach tote bag. For this summers getaway... Just the right individual size for a quick trip to the pool or vacation destination shopping. Outside grommet accent with classic rope handles. Unlined durable cotton canvas. Wide stripes in a bold navy blue with off white natural canvas body. 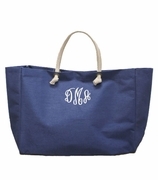 Embroider with a name, weekend island trip or initials. Cute small canvas beach tote bag measures 17"W x 13"H x 7" across bottom. 16 oz canvas. Better than expected very nice handles and fast service what more can you want ! This bag is exactly as pictured. I ordered 7 of them and I received them within a week! Would order again!